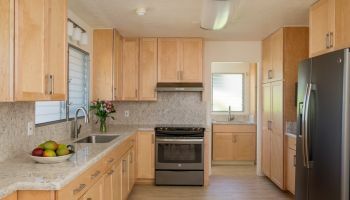 Husband-and-wife homeowners, the Yoshimuras, recently contacted Homeowners Design Center to update and remodel their kitchen and bathroom. According to staff designer Jessica Omoto, rather than being a structural necessity, the real reasons for the remodel were mostly aesthetic and stylistic in nature. She describes the initial state of the Yoshimura property, explaining that, “They had this weird jog from a previous remodel that they wanted to push out and extend the space, so that it was more of a rectangle (shape).” Omoto notes that the kitchen could have gone another 10-15 years before needing to undergo a remodel. As for the bathroom, Omoto says that, “They wanted to have a nice, big, walk-in shower,” one which gives you that luxury spa feeling. 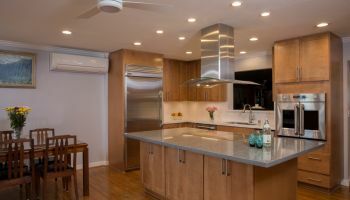 Homeowners opted to do a kitchen & bathroom remodel to create a style & design more suited to their tastes. In order to deliver the rectangle-shaped look that the Yoshimuras were after in the kitchen, Homeowners Design Center removed the the aforementioned jog, a countertop extending from the wall that was used as a dining area, and bumped the wall out to create more space. They also installed maple wood Dynasty cabinets by Omega with a beautiful butternut finish. Omoto notes the cabinetry’s unique, wall, bi-fold style, as well as the fact that it was installed, “18-inches deep versus the traditional 12-inches,” giving the homeowner additional storage space. The countertops are engineered, quartz, ECO countertops by Cosentino, which Omoto explains have, “recycled content,” and luxury vinyl plank flooring, which “gives the look of real wood without the worry,” were also incorporated into the kitchen remodel, which was rounded out with state-of-the-art KitchenAid appliances. The lighting was from Lighting Elegance, who worked with the homeowners in helping to pick out the lighting, in coordination with the other design choices. Kitchen uses a transitional design, combining elements of both traditional & contemporary looks. As for the bathroom remodel, Omoto explains that the same flooring and countertops were utilized here as in the kitchen, in addition to extending the shower space (which also included installed grab bars for aging in place), as well as a darker version of the cabinets, using cherry wood with a rich, chestnut finish. Omoto notes that one minor challenge that they had to deal with in the bathroom was creating enough space for the walk-in shower. "We did need to reduce the depth on some of the vanity cabinetry, (and) at the sink area, we left out the traditional depth," to help create more walk-in space for the shower. Bathroom remodel eschews traditional depths to create more space for the walk-in shower. When asked to classify the look of the kitchen, Omoto describes its style as a unique, “transitional” decor, seen as a winning combination of traditional and contemporary, especially with the incorporation of the pillow edges on the cabinet doors. To find out how Homeowners Design Center can help you with your kitchen and bathroom remodel, or to see more of their projects, click on any photo above or on the company name.